Dr. Warren’s blogger articles on memory. Working memory is a fundamental cognitive processing activity required for learning. It is the part of the brain that is responsible for the transient holding and processing of new and stored information. It’s key for executive functioning skills, reasoning, comprehension, learning and the updating of memory. Here are some sample activities that can help educational therapists, learning specialists, tutors, parents and more help to develop this skill in struggling learners. A common difficulty for individuals with dyslexia is word finding problems. They may know someone’s or something’s name one day, but are unable to access the same information the next. In fact, in those moments when they can not recall the needed name, they may be able to tell you how many syllables are in the name or even the beginning letter. This can be a frustrating and embarrassing problem, and learning memory strategies can help. The key to improving memory is to be mindful and employ memory strategies that are in line with strengths. By playing an active role, individuals with dyslexia can learn to organize material, employ methods and make connections to prior knowledge so new information can be encoded and then easily retrieved. How Can One Determine Strengths that Can Be Utilized? The answers to the following questions, can help tailor an approach! Generate visual associations. A visual association allows you to connect a mental image with the information memorized. Say you are introduced to a woman named Mary. You could visualize her on her wedding day getting married. Say you met a little girl named Patricia. You could visualize giving Patricia a pat on her back. I remember the first time I met a co-worker named Vera. She was wearing a V-necked shirt, so I made the conscious effort to visualize Vera in her V-necked shirt. Say you met a guy named Paul. Perhaps Paul is small. If not, perhaps you could find some part of his body that is small – such as his nose or ears. Create auditory associations. A word may sound like something that reminds you of the person. For example, Rich may be a wealthy or a “rich” man. Use the alphabet. Search through the alphabet to see if that jogs your memory. Use a pen and paper. The physical act of writing down the names that you have to remember, can be very helpful for some individuals. When you meet someone new, you can place their name and any notes in a little notebook on your smart phone. Utilize verbal rehearsal. Some individuals are assisted when they are able to verbalize new information. After you are introduced to someone, say their name aloud and then try to use it as much as possible. When meeting new people, associate their name with another person you already know that has the same name. I remember the flower impatiens, because I used to get impatient trying to remember the name. Organize information in a sequence or series. If you have to learn a group of names, organize them in alphabetical order. Organize the information into categories. Arrange the material you have to learn by placing the names into groups. Unite two or more strategies for better results! It will be even easier to recall names when using more than one strategy! Geranium rhymes with the word cranium (auditory) and my red geraniums in my garden are shaped similar to a brain (visual). When I’m networking and meet new people online, I utilize both a visual and tactile approach. All new people are placed into a document within a table. In the first column, I copy a picture of that person. In the second column, I record their name and contact information. In the third column, I record some notes about them and our correspondences. So, if you want to improve your memory or help others to do so, be sure to try some of these mindful and multisensory approaches. I hope you found this helpful! If you have other ideas, please share them below this blogpost. Most recently, scientific methodologies have been utilized to assess the validity and utility of visualization. In the past 50 years, researchers have looked at the impact of mental imagery on academic achievement. There is a host of research on this topic, and this blog focuses on some of the key studies that investigate the impact of mental imagery on learning. Research has investigated the effect of visualization on reading abilities. Studies have shown that there is a direct link between poor comprehension skills and the inability to visualize text (Gambrell, 1982; Gambrell and Bales, 1986; Gambrell and Jawitz, 1993; Steingart and Glock, 1979). In contrast, research substantiates that students who picture what they are reading, thus painting the setting, characters and plot on the canvas of their mind’s eye, have better comprehension scores and find greater joy in the reading process (Bell, 1991; Gambrell, 1982; Gambrell and Bales, 1986; Gambrell and Jawitz, 1993; Long, Winograd and Bridge, 1989; Sadoski, 1985; Sadosi, Goetz and Kangiser, 1988; Sadoski and Quast, 1990; Steingart and Glock, 1979). Algozzine and Douville (2004) also assert that training in mental imagery aids students in generating their own mental images when reading. In addition, students who visualize while reading are better at making inferences and accurate predictions (Gambrell, 1982; Steingart and Glock, 1979). Moreover, research on the efficacy of using visual imagery has also been shown to improve deep connections that aid in memory recall and reading comprehension (Craik and Lockhart, 1972). Clearly, visualization is a necessary cognitive skill that helps readers attend to and encode literature, but mental imagery also helps learners develop their expressive language abilities. Employing visualization has also been demonstrated to enhance writing skills in students (Jampole, Konopak, Readence, & Moser, 1991). In particular, gifted students who received mental imagery instruction outperform those who did not on originality and the use of sensory descriptors (Jampole, Konopak, Readence, & Moser, 1991). Additionally, Algozzine and Douville (2004), claimed that training in visualization helped students generate their own mental images when writing. Furthermore, Kwan-Lui, Liao, Frazier, Hauser, and Kostis (2012) reported that visualizing events described in writing, “is crucial for constructing a rich and coherent visuospatial mental representations of the text.” Finally, when Jurand (2012) researched the efficacy of visualization for a summer writing program, he reported that art projects were a successful method that helped students to visualize their ideas during the writing process, and they also served to develop the students’ imagination. Yet, reading and writing are not the only areas of academic achievement that benefit from mental images. Visualization hones mathematical abilities too. Dougville, Pugalee, Wallace and Lock (2002) suggested that using mental imagery can help learners to, “concretize abstract mathematical concepts in ways that facilitate more effective problem-solving.” They also noted that more advanced math imaging can be achieved through storyboarding activities where the steps of a math problem are drawn in a pictorial sequence. Dougville, Pugalee, Wallace and Lock (2002) claimed the words of their participants offered compelling evidence. Participants suggested that using mental imagery was like, “having a video camera in my brain” and like “going to a movie in my head” and that, “reading and learning was more fun” for the participant students. Clearly, the mathematics community embraces the benefits of visualization but do the hard sciences concur? students visualize graphic progressions and cycles, as well as webs, diagrams, and lab experiences, they can improve their understanding and memory of the content. Although the research on visualization in the sciences is sparse, it appears clear that all areas of instruction are enhanced by learning to use one’s mind’s eye. Overall, mental imagery appears to impact all areas of academics. Douville and Algozzine (2004) unite the prior outcomes, and propose that visualization can be used across the curriculum. How Can I Teach This Needed Skill? I have found that the best way to teach visualization is through games and mindful discussions. To help with this process, I wrote a book entitled Mindful Visualization for Education. In fact, this blog includes an excerpt from the book, and all the full citations are available in the full document. This 132 page downloadable document (PDF) provides a review of the research, assessment tools, over twenty game-like activities and lesson suggestions in all the subject areas as well as for vocabulary development and listening. In addition, I offer two PowerPoint downloads that review the 10 core skills that need to be developed to optimize visualization abilities. If you have any thoughts on the use of visualization for learning, please post a comment! Also, if you have had some success with visualization in the classroom, please share your experiences. the needed information in the moment. For many students this happens during stressful moments such as test taking, but for others, such as most students with dyslexia, this is a pervasive problem that requires intervention. Exactly is a Wording Finding Problem? processes of encoding, retrieving or a combination of encoding and retrieving. What Are the Symptoms of Word Finding Problems? Word Substitutions – Using another word that has a similar meaning such as utensil for fork. – Providing descriptions of the word such as, “it’s the apple that is green and sour” for granny smith apple. Gestures – Acting out the targeted word (e.g. “You know, when you do this…”). Other Learning Challenges Struggle with Word Finding Problems? is not the only learning diagnosis that struggles with word finding difficulties. Word Finding Problems be Remediated? the Alphabet: Go through the alphabet and say the sounds of each letter and think about whether the word may start with that sound. remember names, associate the first letter with the object person or place. For example, when I met a woman named Vera, I noticed that she was wearing a v-necked shirt. Whenever I saw her, I remembered her wearing that shirt and it triggered her name. Associations: Associate an idea or quality with the object. The way I remember the name of the flower impatiens is to remember how impatient I get when trying to think of the name. Associate a Rhyming Word: Use a rhyming word with the object. To remember the flower’s name geranium, I think of cranium – geranium. Visual Associations: Associate a visual to aid recall. I often associate a visual when using rhyming words as combining strategies can help to assure future recall. In the example above, cranium – geranium, one may notice and then visualize that a full geranium blossom resembles the shape of a cranium. Strategies – Using visual hints that lie within the name or word that one wishes to quickly recall. A visual hooking strategy for the name Richard might be the recognition that the word rich is in Richard. One could then visualize Richard as being very rich. Use Auditory Hooking Strategies – Using auditory hints that lie within the name or word that one wishes to quickly recall. An auditory hooking strategy for the vocabulary word benevolent might be that the word sounds like be not violent. Then one can think, be not violent – be kind, and benevolent means kind in spirit. a picture of the object, person or place, create a document or memo and label each image. Make this document accessible from technology such as computers and smart phones. Name Associations: Associate names of new acquaintances with other people that have the same name. Visualize the Word: When you can not recall a word, use your mind’s eye to see the word written on paper. Use Technology: Use technology to find the word you can not recall. For example, you can go onto Google and describe the word. This will often guide you to the answer. There Any Games that Strengthen Word Finding? are a number of games that I have found to help strengthen word finding. Lumosity – Lumosity is an internet site that offers games for the brain. Two of their games, familiar faces and word bubbles, are great for exercising word finding. Just remember to truly remediate your word finding difficulties and reach your full potential, you must make a conscious effort to use the strategies that work best for you. difficulties can all be traced to working memory mishaps. Symptoms of Working Memory Difficulties? Providing fun and engaging activities that require attention, mental manipulation, and following directions such as Red Light, Green Light, memory games and treasure hunts can help. However, ready made activities that develop working memory activities can save preparation time. Come get some FREE SAMPLE ACTIVITIES. I hope you found this post helpful. If you have any questions or thoughts, please leave a comment. “little trips” outside of the classroom. What Can We Do to Help Students Improve Memory, Activate Their Whole Brain and Improve Attention? information as well as perform mental manipulations. the left and right hemispheres of the brain. between the right and left sides of the brain. What are Attention Building Activities? Attention building activities require students to maintain attention in order to complete the exercise. Without being fully focused, the drills are virtually impossible. If instructors or learning specialists slowly increase the number of activities that the student completes in a single session, they will be training the brain to concentrate over longer and longer periods of time. Why I Created and Use These Activities with My Students? call to mind similar words or concepts. gain improved confidence in their ability to demonstrate their knowledge. can help students learn and encode novel material in an organized fashion. allows students to organize material into manageable units. also aid in some learning situations. lines. Creating rhymes with academic content embedded can make recall an easier process. mental or drawn image with the information memorized. sound like something that reminds you of it’s meaning. that help students make connections and see the big picture. remembering vocabulary words because the answer is embedded in the question. way of securing information into one’s memory. are wonderful tools that can assist students in memorizing mundane facts. 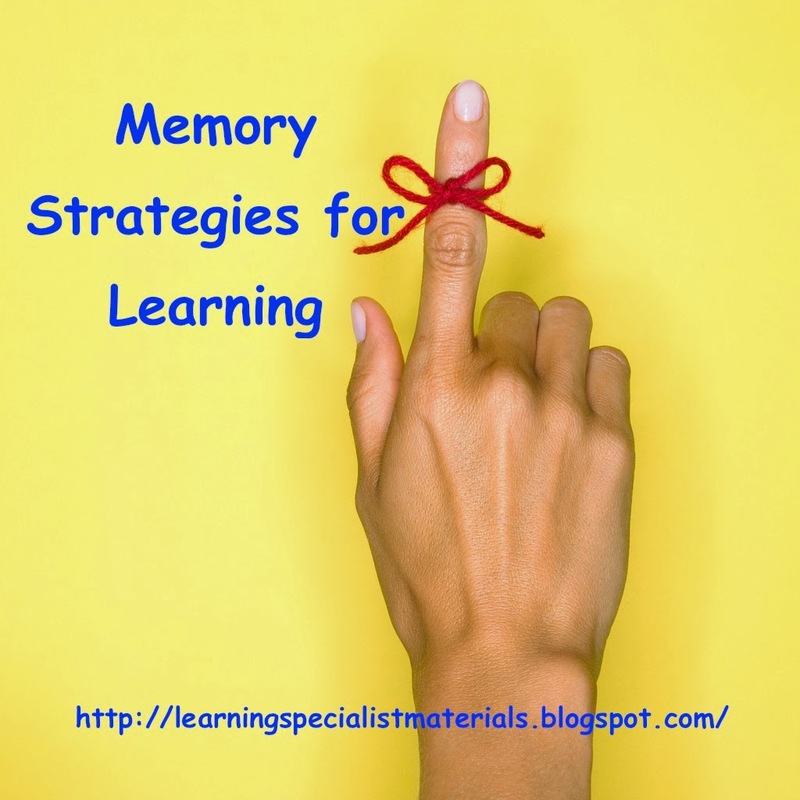 For a full free document that goes into greater detail on the above memory strategies and provides examples Click Here. this difficulty tends to worsen. be able to access it without a word bank. way that won’t be too frustrating? will help in the process. I have had great success with all four of them! If you know of some others, please let me know.